There’s been a huge amount of publicity in Diabetic circles for Afrezza as the aggressive tactics of investors talking the product up through a campaign of blogging and Twitter advocating the new insulin. It seems to be a breakthrough, but we shouldn’t forget that it is absorbed using pulmonary blood vessels and as such could, after long term use, have some side effects. There hasn’t been a proper long term study, so any commentary on that would be speculation at best at this point. There is, however, an alternative oral insulin. Oral-Lyn from Generex completed Phase III trials on Type 2 diabetics in India in 2013, and is, as I understand it, is the first insulin to be granted a license under the FDA Treatment Investigational New Drug program. There is a helpful factsheet available on the Generex website. The results that were published of the trials that took place appear similar to Afrezza. The details can be found on the UK New Drugs database. July 13: Results from PIII study comparing buccal insulin spray with rapid insulin injection in pts with type 2 diabetes. Oral-lyn significantly lowered the HbA1c at 6 weeks (6.96% vs. 7.42%) and 12 weeks (6.99% vs. 7.24%) compared to baseline (p< 0.05) while injected human regular insulin did not significantly lower the HbA1c until 12 weeks. Oral-lyn resulted in a significantly lower HbA1c at 6 weeks than did injected regular insulin (p less than 0.05). At 12 weeks the HbA1c for both groups were statistically comparable. Unfortunately, the two studies that were undertaken for Afrezza and Oral-Lyn are not quite the same, so determining the relative efficacy of the products is a little difficult. What is worth noting with Oral-Lyn is that it is not a truly inhaled product. It is designed to be absorbed by the buccal membranes in the mouth, rather than in the lungs. As a result, this should reduce the risks of respiratory tract or lung problems. As with any form of absorbed drug though, questions will always be asked about the long term impact on the cells where it is absorbed. The delivery system is known as “Rapid-Mist” and is proprietary to Generex. 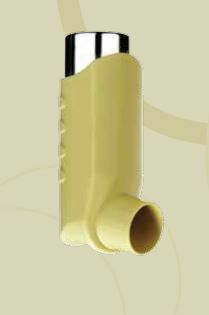 It looks a lot like a Ventolin inhaler to me! There were supposed to be Phase III US clinical trials in the US in 2009 for Type 1s, amongst other things, but it has been very quiet since then. This paper from 2009 goes into detail about the work that was done up until that point. The key take away was that to deliver a dose appropriate for a meal, many sprays were required and that many of the trials up until 2009 weren’t terribly thorough. With each spray containing 10u and delivering 1u actively, the 400u canister doesn’t last very long! The product seems to have been launched in March 2015 in some emerging markets, but not in the US or EU. Reading between the lines of the various bits of information on the web, the initial formulation of the product was not concentrated enough and the number of sprays didn’t go down well with trial users, especially with the observations about it having an odd taste. It looks as though they went away to redesign the molecular structure to provide a much more concentrated product. Possibly ten times more concentrated according to the linked article! There doesn’t seem to be much of an outlook in the UK for Oral-Lyn. Generex seems to still be developing it and marketing it, however, it would appear that we are awaiting a Gen 2 product in the European and US markets which I can only assume requires fewer sprays given the higher concentration they have been working on. The oral insulin world looks to be an exciting one to watch, although the products could be considered luxury or needs only drugs as they have appeared to be a lot more expensive than the subcutaneous alternatives thus far. Given that Generex have focussed the initial roll outs of Oral-Lyn on what are generally considered to be emerging markets, is it possible that this one bucks the trend and that the costs are comparable or better than those of the market incumbents? Only time will tell. If this does prove to be the case, then the likelihood of it appearing on your UK prescription options can only improve!